Charles Brooks Sr., a mainstay of southern U.S. political cartooning in the mid-20th Century and the editor/founder of the Best Editorial Cartoons Of The Year series, died on September 29 at his home in Alabama. He was 90 years old. Brooks was born in Covington County, Alabama in the unincorporated community of Hopewell (now Hopeful). He was an artist as a child, constantly studying newspaper and editorial comics and spending much of his free time with pencil and paper. Brooks studied at Birmingham-Southern college following high school before making the trip north to learn from Vaughn Shoemaker of the Chicago Daily News and the other distinguished faculty of that era's Chicago Academy of Fine Arts. Brooks met his future wife during his initial sojourn north, which lasted for approximately two years. Brooks entered the US Army in 1942, becoming a second lieutenant with the 531st Engineer Shore Regiment. He participated in the D-Day invasion and the Battle of the Bulge. He also found time to contribute cartoon work to the military publication Stars And Stripes. Brooks moved back to Chicago for a few years after the war, apparently finding work with an outfit at the Fred Zaner Advertising Cartoon Syndicate. He began to search for opportunities back in Alabama and was hired by the Birmingham News as its cartoonist in 1948. Brooks quickly garnered attention in the region as a no-nonsense populist unafraid to take on corrupt government officials, the Ku Klux Klan, or the deeply unfortunate conflation of those two groups. Brooks won the Sigma Delta Chi Award for outstanding editorial cartoon in 1960 for a piece that appeared in 1959 called "Two Deadly Weapons" about unsafe driving. One of Brooks' most famous cartoons was a piece in late 1966 showing Disney cartoon characters gathered around the grave of the just-passed Walt Disney. One biography states that Brooks won 13 Freedom Foundation Awards, a VFW national award, and two Vigilante Patriot awards. He was a widely published illustrator as well, serving hundreds of different clients. 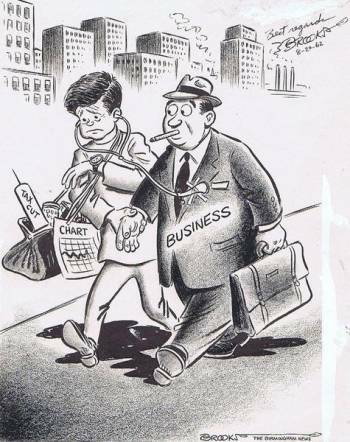 In 1969, Brooks became president of the Association of American Editorial Cartoonists. 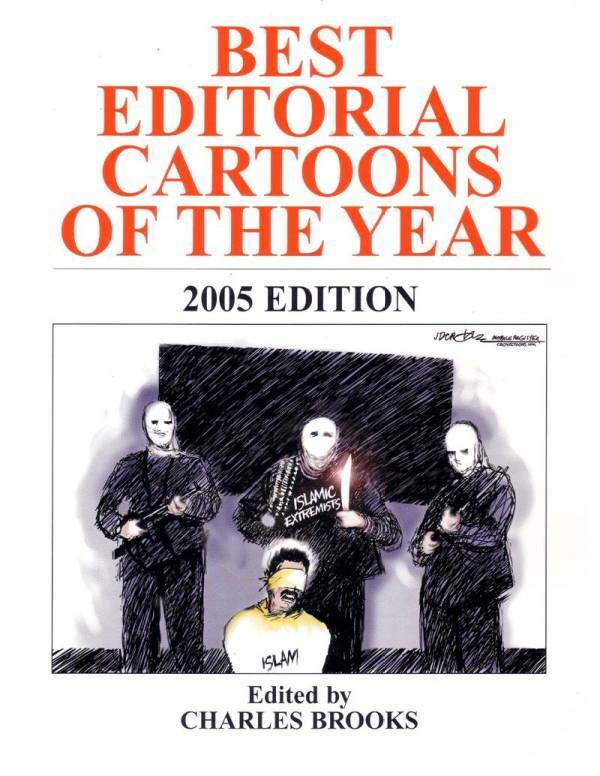 It was while in that position that he conceived of and started work on the Best Editorial Cartoons Of The Year series, launched in January 1972 by Pelican Books (a 30th anniversary edition will be released in 2012; its status beyond that is uncertain). According to the piece linked-to in this post's initial paragraph, five volumes of that book were banned in the Soviet Union in the late 1970s. He retired from the Birmingham News in 1985, a rare figure both for the support of other cartoonists he showed through his annual series and for being a socially conscious conservative cartoonist in a field that has historically featured relatively few of either kind. According to Michael Cavna, Richard Nixon once called Brooks the Herblock of the Right. Scott Stantis remembers the cartoonist here. Charles Brooks Sr. is survived by his wife, a son and a daughter. He was scheduled to be buried today.